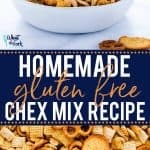 Easy homemade Chex Mix recipe made with all gluten free ingredients. 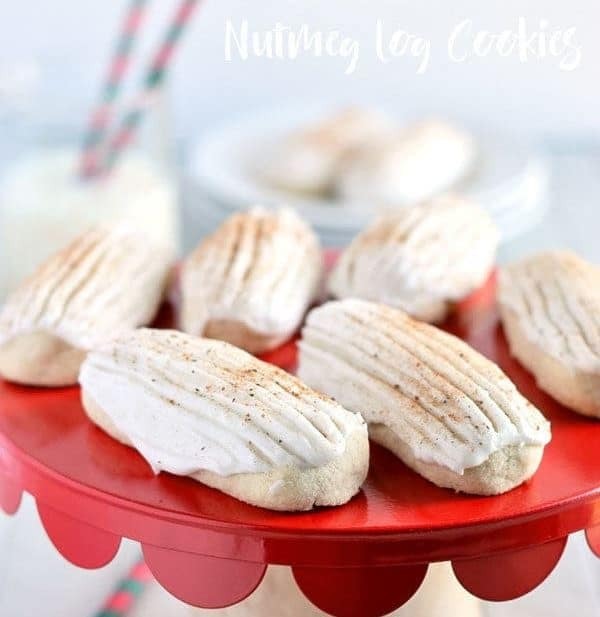 This is a simple way to make a gluten free snack that all your guests can enjoy at your next party! 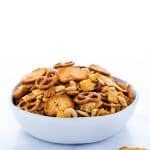 If there’s ever a snack at a party that people gather around and just CANNOT leave alone, it’s Chex Snack Mix. There’s so many different kinds of treats and flavors going on, it’s literally a party in a bowl. While most Chex cereals are gluten free, Chex mix is not thanks to the Wheat Chex and delicious add-ins (I’m looking at you bagel chips). So what’s a girl to do when she loves to cook/bake and her husband loves to eat all the gluten free food? Make my own homemade Chex Mix recipe, duh. Yes, the 90’s girl is still there. Speaking of 90’s, I saw a meme on Facebook saying that in 2 years, the 90’s will have been 30 years ago. 30 YEARS. When I think 30 years ago, I still think the 70’s. Clearly, despite the bills, responsibilities, children I’m raising, taxes, the natural red highlights I had that have turned white, Common Core math I now have to learn how to do, and fine lines that have popped up on my forehead that weren’t there last month, I haven’t grown up much. Please tell me yours is looking similar?! Seriously, just pass me the entire bowl of Chex Mix. But really seriously, I couldn’t stop eating this while photographing it. Like, literally, COULD.NOT.STOP. Thank God it makes a bunch so I didn’t have to worry about having a half empty bowl! Lets talk for a minute about the ingredients in this Chex Mix and what I did to make it gluten free. For one, I don’t use the Wheat Chex, just a combo of Rice Chex and Corn Chex. 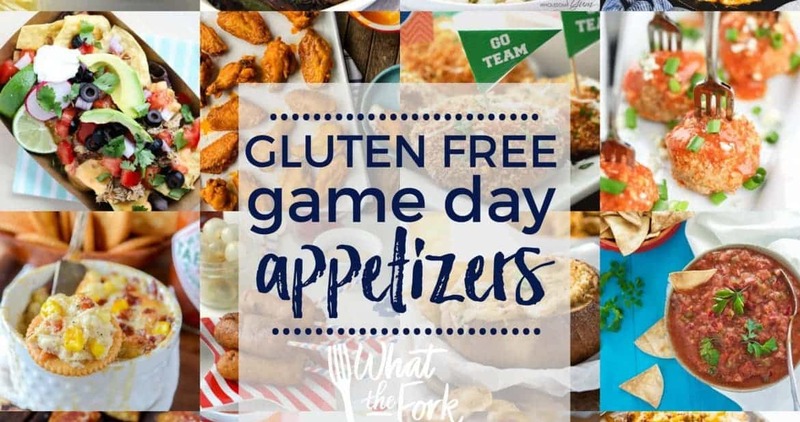 I use gluten free pretzels – there are several brands to choose from, just don’t use a flavored one. Salted ones are fine, btw. 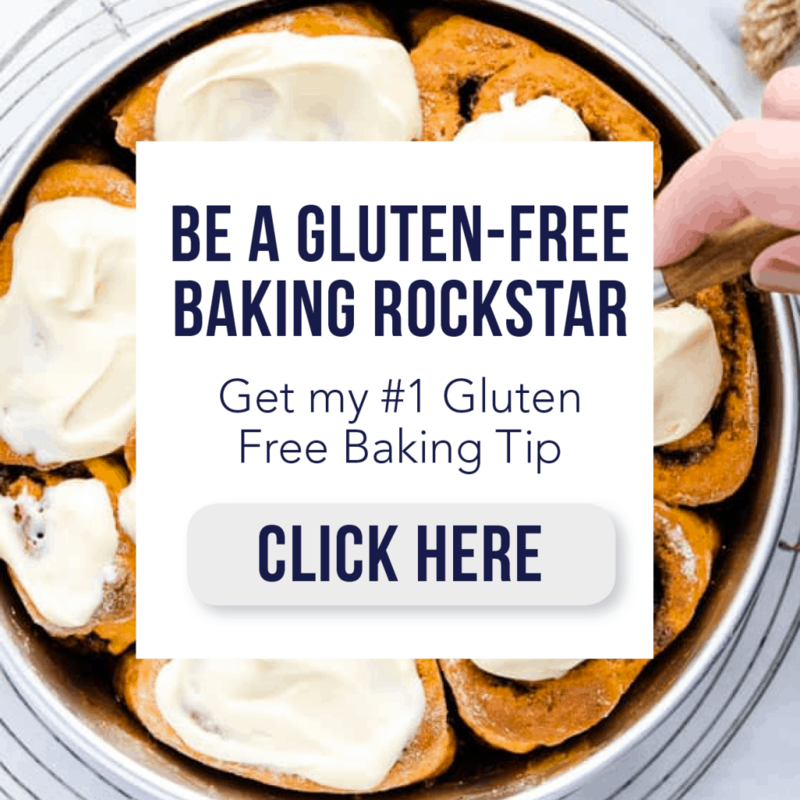 For bagel chips, I use Glutino Bagel Chips (no this isn’t sponsored) but if you really want to make your own, just slice a gluten free bagel into little tiny rounds and bake until it’s pretty much toast. That’s a little too tedious for me so store-bought is fine. Ok Ina. I use lightly salted mixed nuts, you could use unsalted if you really want but I like it best with the lightly salted. Regular salted nuts are a little too salty for my taste. And trust me, I like my salty snacks. Worcestershire Sauce is not always gluten free so check your labels. I use Lea & Perrins, which is gluten free here in the US. 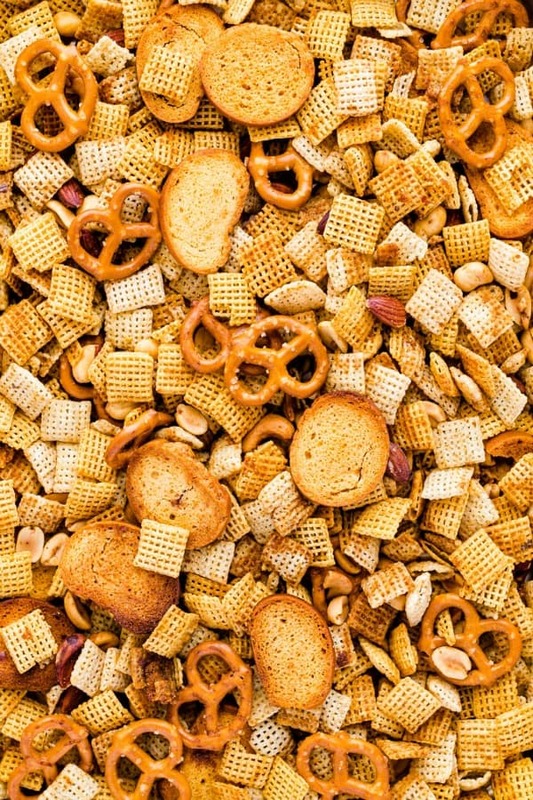 Lawry’s Seasoned Salt is one of the main seasonings in this gluten free Chex Mix recipe. Lawry’s (owned by McCormick) provides allergen information in their FAQs and I suggest always checking your label. If you prefer making your own seasoned salt, Kristin from Iowa Girl Eats has a Homemade Seasoned Salt recipe. You guys, I’m going to be brutally honest here. 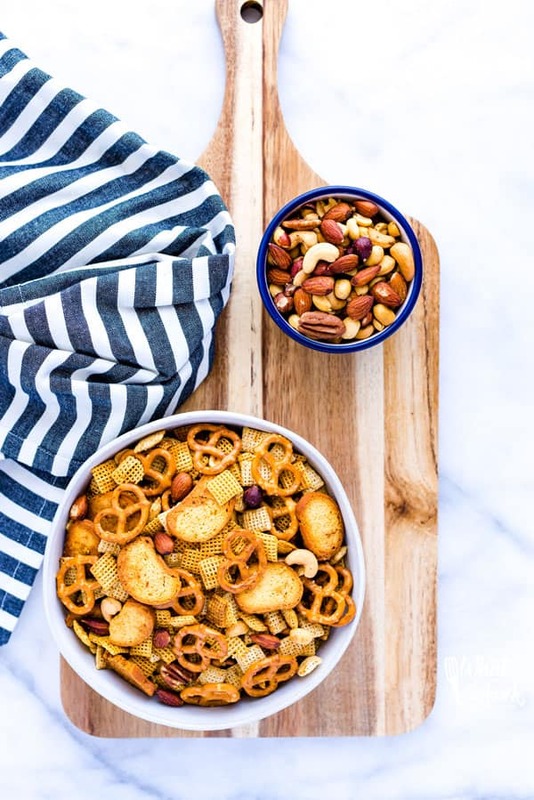 Homemade Chex Mix is … wait for it…. 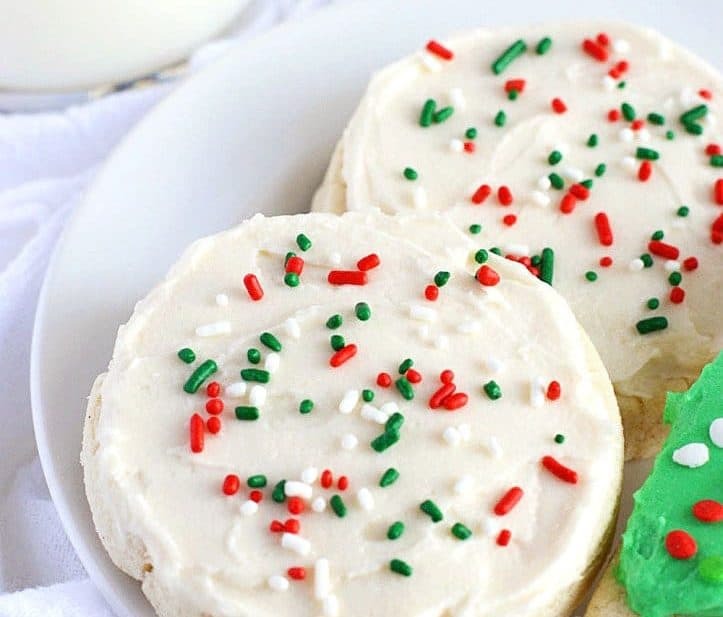 incredibly easy to make. My youngest (she’s 4) helps make this frequently. The one thing you really need to have is a very large bowl to mix this altogether. 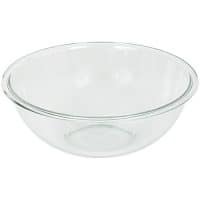 I use a 4-quart Pyrex mixing bowl and it is FULL. I highly suggest using one big bowl vs. mixing twice with half the ingredients in a smaller bowl. 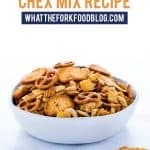 You guys are going to love this Chex Mix recipe and I double dare you to stop at just one handful. Spoiler alert, you won’t be able to. Enjoy! 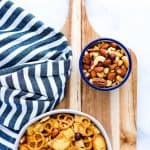 If you’re looking for more easy gluten free snack recipes to try at your next party, check out my Holiday Trail Mix, Chocolate Dipped Fritos, Fried Almonds with Thyme (Whole30 compliant), Crack Dip, or Texas Caviar. Add the corn Chex, rice Chex, mixed nuts, pretzels, and bagel chips to a very large bowl. Mix to combine then set aside. 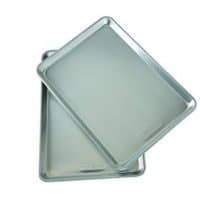 Melt the butter in a small sauce pan over low heat or in the microwave in a microwave-safe bowl. Add the Worcestershire sauce, seasoned salt, garlic powder, and onion powder to the melted butter and whisk to combine. Pour the butter mixture over the Chex mix. Gently stir well until coat all of the Chex mix with the butter mixture. 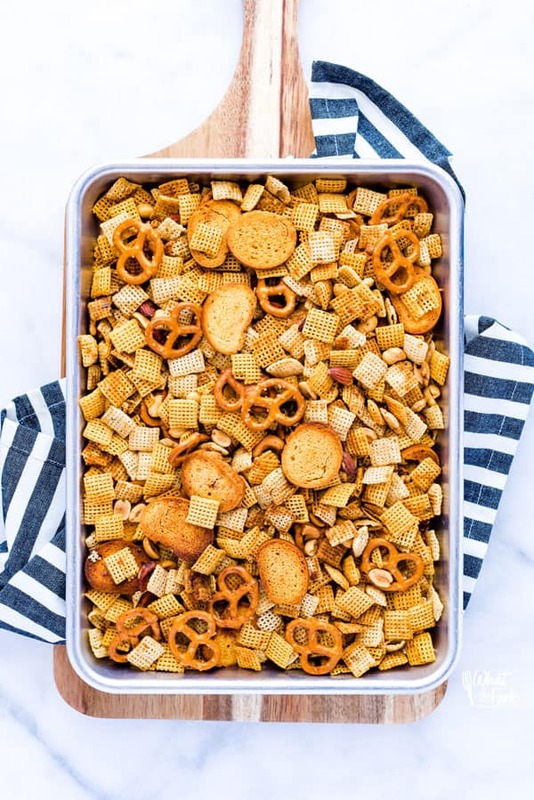 Split the Chex mix between two rimmed half-sheet pans and spread evenly on the pan. 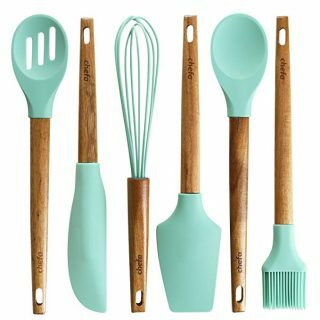 Bake for 1 hour, stirring every 15 minutes. 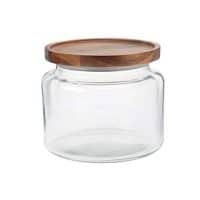 When done, cool completely then store in an air-tight container. For dairy free, sub the butter for vegan butter or refined coconut oil. Check your packaging labels to verify that your dry ingredients are also dairy free.